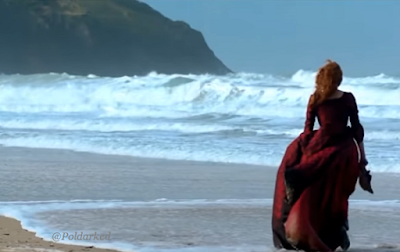 Have you ever wondered if Demelza's red ball gown in Poldark series two survived its dip in the sea? I know I have and now there's the chance to see just how good it looks at a fabulous exhibition at Nuneaton Museum and Art Gallery. Dressing the Women from Poldark has dresses worn by Demelza (Eleanor Tomlinson), Elizabeth (Heida Reed), Verity (Ruby Bentall) and Caroline (Gabriella Wilde) and includes Demelza's ball gown. The costumes are on display this summer and entrance is free. 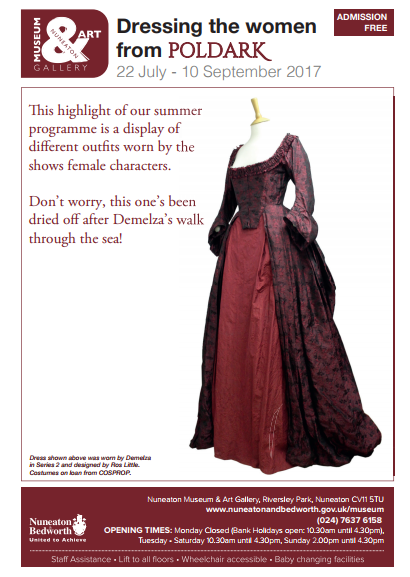 Dressing the Women from Poldark runs until 10 September at Nuneaton Museum and Art Gallery, Riverlsey Park, Coton Road, Nuneaton, CV11 5TU. The venue is about a ten minute walk from the train station. The opening times are: Tuesday - Saturday: 10.30 am - 4.30 pm Sunday 2.00 - 4.30 pm. Closed Mondays except Bank Holiday Monday when it is open 10.30 am - 4.30 pm. It's really too good to miss!